Despite everything, I still like cooking for the sheer pleasure of doing it. Every Friday I jot down a badly organized agenda for the upcoming week: my aim is to sort out what I have to prepare for the blog, what I have to cook for the clients and when I have a cooking class, what needs to be cooked and photographed for the cookery magazine Ci Piace Cucinare and what we’ll be eventually eating in the studio in the midst of the chaos of an ongoing photo shoot or in the evening, exhausted, on the sofa. I choose what to cook based on seasonality and requests, sometimes on the spur of the moment. Last week I craved chocolate cookies, as big as your palm, deep dark, studded with chocolate chips and sprinkled with flaky salt. My desire was not to eat them, but to spend an hour pretending that the most important thing in the world was that dense chocolate dough, the smell of vanilla, the temperature of the oven. I treated myself to a relaxing sensuous activity, like baking cookies is, focusing on tactile sensations, on that brown colour that portend only good things. When I took those cookies out of the oven, a chocolate smell wafted through the kitchen, and I felt happy, complete, I had reached my goal. Here Tommaso comes into play. He grabs a cookie, then a second one. Finally you baked something that I really like. Wait a second. What? I started making a list of all the delicious food I had cooked, when I had this revelation: he was never the one to choose. Every time it was my whim or an assignment. Growing up you can potentially choose everything you would like to eat, but then there are only a few times when you actually give yourself permission to have it. So I heard myself saying: tell me what you would like to eat, and I will gradually cook it for you, it is a promise. A happy man beamed in front of me: pizza, please give me a pizza. And meatballs, the simple ones, without too many ingredients, a little flattened, fried and then soaked in tomato sauce. And gnocchi alla Romana, the semolina gnocchi, crisp with butter and Parmigiano. Wouldn’t you define this as comfort food? He craved simple food, that food that your mother would cook you, that food that would make you perform a happy dance as it was just what you wished to find on your plate as a kid. This is how I got to prepare the gnocchi alla romana, which are made with a fine semolina flour, not with potatoes. There was a problem, though. They have been our dinner so many times when I was a child, but those semolina gnocchi would come directly from the supermarket as a pale gummy sausage, wrapped in plastic. All you had to do was to peel them off and slice that unappealing sausage into thick and round gnocchi. Mum would blanket them with béchamel, a shower of Parmigiano and a few knobs of butter. She would stash them in the oven until golden and bubbling. What we liked was all the dressing, definitely not that gummy gnocchi. The gnocchi of Tommaso’s memories have the same shape and the same industrial origin, even though his mum would just make them au gratin, with butter and Parmigiano. This is how he wanted me to cook them, exactly like that. I searched for the recipe on The Talisman. Italian Cook Book, by Ada Boni, as when it comes to Roman recipes she is my reference, along with La Cuochina. I have an original Italian version. I leafed through the pages of that aged book, found secondhand on eBay, belonging to someone else’s grandmother. I learned to know this woman thanks to the few annotations she left, written in an old fashioned handwriting with a pencil. She tried the gnocchi alla romana, she underlined a sentence, to which I paid particular attention, as if she had been behind me, to show me where I should not make a mess. Ada Boni suggests to cut the gnocchi into squares or lozenges, which is actually the best way to avoid scraps. In honour of our memories, though, I cut them into disks with a 5 cm round baking cutter. They are much simpler than I could have imagined, the smell of butter and cheese is exactly that of my memories, but the taste, the taste! The gnocchi are flavourful even on their own, with a delicate melt-in-your-mouth texture that makes the béchamel blanket completely superfluous. They are a dish to keep in mind for family gatherings or dinners with friends, as the gnocchi can be prepared in advance and then you can baked them at the very last minute. 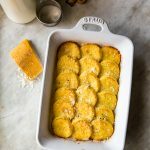 This makes them suitable for your midweek dinners, too, when you are running out of time and all you would love is someone who could feed you a comforting dish of gnocchi alla romana. It doesn’t matter if it is you who made the gnocchi the day before, the warm feeling of having someone who takes care of us does not fade, hugging you in a cloud of nutmeg, milk, butter and Parmigiano. Pour the milk into a saucepan and grate some nutmeg in it, about half a teaspoon. Bring the milk to a simmer, then sprinkle in the semolina in a slow and steady stream, stirring constantly to avoid lumps. Keep on stirring over medium-low heat, with a wooden spoon, for about 7-10 minutes. You will obtain a kind of thick polenta: when it will start to pull away from the sides of the saucepan and it will be too thick to stir, remove the semolina from the heat. Transfer the thick semolina polenta into a bowl and add the egg yolks, half of the butter and half of the grated Parmigiano. Stir until thoroughly incorporated, then taste and add more salt if needed. Now the semolina will be smooth, and quite dense, but not so much that it cannot be spread with a spatula. Spread the semolina in a 1 cm thick layer onto a marble surface or in a low pan. You can use a spatula or your wet hands. Let it cool down and thicken for about two hours. When the semolina is completely cold and solid, cut the gnocchi in your favourite shape: traditional squares or lozenges or, as it is now more common, with a 5-cm round pastry ring. Preheat the oven to 200°C (400°F, gas number 6). Place the gnocchi in a pan slightly greased with butter. Traditionally, the gnocchi were arranged in several layers, in a pyramid shape. I lined them in the pan, slightly overlapping, as my mum has always done. Do not throw away the scraps, but collect them in a smaller tray, they will not look nice, but they are as good as the well-formed ones. Drizzle the gnocchi with the leftover melted butter and sprinkle with the remaining grated Parmigiano, then bake until golden and crisp. Serve immediately and enjoy. Which is your fondest memory of a childhood store-bought, industrial food? Something you would not eat today but that then seemed like the best thing in the world? For Tommaso it was these gnocchi, for me the frozen vegetables known as contorno mediterraneo, Mediterranean side dish, with zucchini, eggplants, potatoes and bell peppers (I would search for the most scorched eggplant cubes, they were my favourite part) and the speedy pizza, a frozen square pizza that you could defrost in the oven or even directly in the microwave. Claudia and I would have this as an afternoon snack while watching cartoons on the sofa. With the two leftover egg whites make meringues. I made tiny ones to cover with chocolate. This is the Roman-style gnocchi recipe by La Cuochina. This is Rosemarie‘s recipe for Roman style semolina gnocchi. 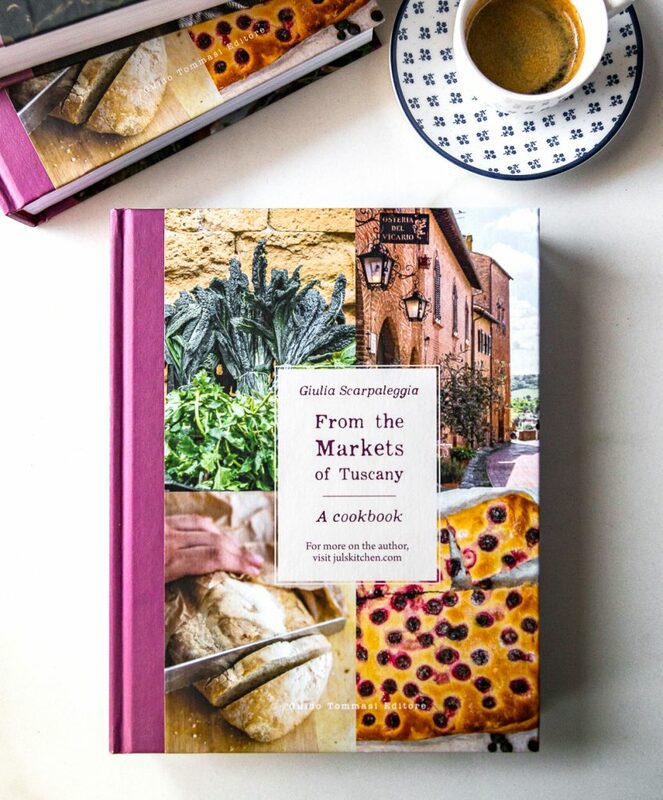 Even Ottolenghi has a recipe for gnocchi alla romana. Last but not last, Nicoletta’s recipe for Gnocchi alla Romana, Roman-style Semolina Gnocchi. Add this winter salad by Rachel Roddy and turn these into a meal. Many thanks, Juls, I love this post and I’m going to make this. Would it be okay to top it with just a little tomato sauce (not too much)? On Saturday morning, we bought some warm, fried, polenta squares at a stand in Mercato Sant’Ambrogio—the bag was empty by the time we arrived home! When I was a boy it was in the 1950s and the frozen food revolution hadn’t yet hit the U.S. in a big way. We were a big family (6 kids) and my mother used to cook just about everything from scratch. Frozen T.V. dinners were quite popular at that time—turkey with dressing and frozen vegetables. We had them occasionally and my mom would always save their aluminum containers and make he own t.v. dinners! She’d roast a turkey then cut the meat in slices and put it in the containers with some mashed potatoes and blanched vegetables. She’d cover them with aluminum foil and pop them in our big freezer! I have a very similar recipe using polenta. I make it on occasions when my family get together, my brother and sister are both coeliac (luckily I am not!). Although the first time I made it for them I now have to make a huge dish as everyone else loved it too. I usually add some vegetables around the gnocchi, roasted cherry tomatoes, roasted capsicum, sometines mushrooms, maybe olives. Then lots of cheese!! Love this post! I have been looking back to simple comfort food from my childhood too, lately. Ada Boni’s Talisman was the cookbook I purchased and treasured from my year spent in Italy as a student, ages ago! Made and love the Gnocchi!! Do you think they could be made with rice flour? I have a Gluten/ Free client to cook for?? Your gnocchi look amazing and just perfect, Giulia! I made them in Canada and my family had never had them. It was a success. You’re right, it is a dish for family gatherings. As for your question, I am ashamed to answer sofficini, which was the first thing that came to my mind 🙂 . P.s. Thank you for mentioning me and the blog!! PP.SS. And those meringues…gorgeous! Abbiamo appena vissuto una tempesta di neve dove vivo e c’è un’altra tempesta di neve che verrà la prossima settimana. Quindi, io bramo il comfort food e questa ricetta è perfetta. Grazie per la condivisione! Un cibo della mia infanzia che non vorrei mangiare oggi è Lunchables. Erano trendy come bambini, non estremamente gustosi. I can’t wait to try this recipe. I make potato gnocchi sometime, buy sometime, usually do with soup or broth. I like to serve polenta in this style though. Your post really vibed with me. Comfort foods are interesting. I think it’s more about where you’re so happy or just feeling in your place in the world when you eat it and every thought and feeling there just sticks. One of mine is poached eggs in a kettle with buttered toast. My Grandma would always make them for me and sometimes on Saturdays she’d bring all of it into the living room so I could keep watching my cartoons 🙂 Weirdest industry food we ate in my opinion (well, one of them), is these little vienna sausages. They come in a can with this somewhat gelled stuff around them. Do you have them too? They’re actually pretty good if you can get past the texture. I made this last night, and WOW! This is a very easy dish to make and the flavor is incredible! I served it with a warm tomato sauce on the side and a green salad, and my family loved it. I will definitely make this again and share the recipe. Thank you! oh I am so happy!! thank you Jacqueline! thank you so much Hazel, it means the world to me!